Kids and teenagers have died and suffered serious injuries from unsafe moveable soccer goals. 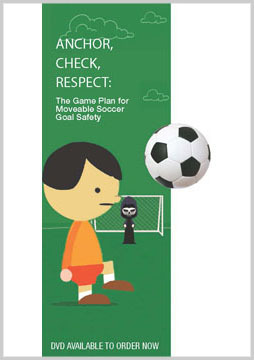 You can help prevent death and injury from happening to young soccer players. A video, starring former Melbourne Victory Captain Adrian Leijer, shows how to install and use moveable soccer goals correctly and safely. By following the easy steps in the video and learning the safety information, you can help ensure that soccer is a safe activity for everyone involved. select DVD in the order options on this page.